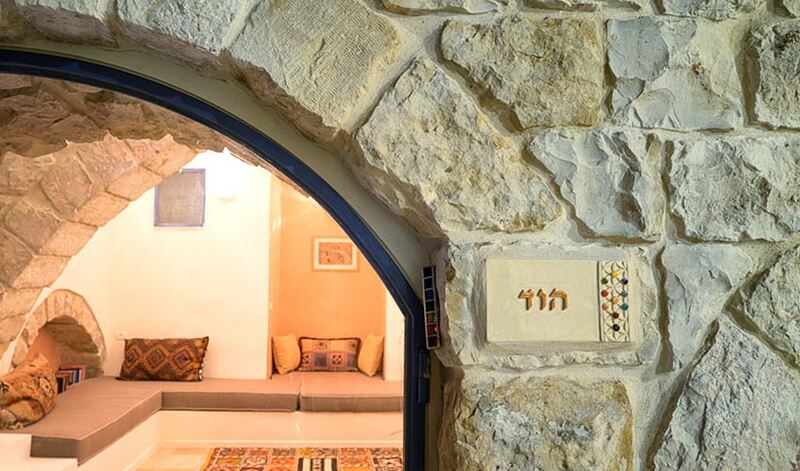 The world’s first beit midrash is where the sages say Jacob studied for 14 years on his escape to Lavan and where Abraham sent Isaac to study after the akeidah. 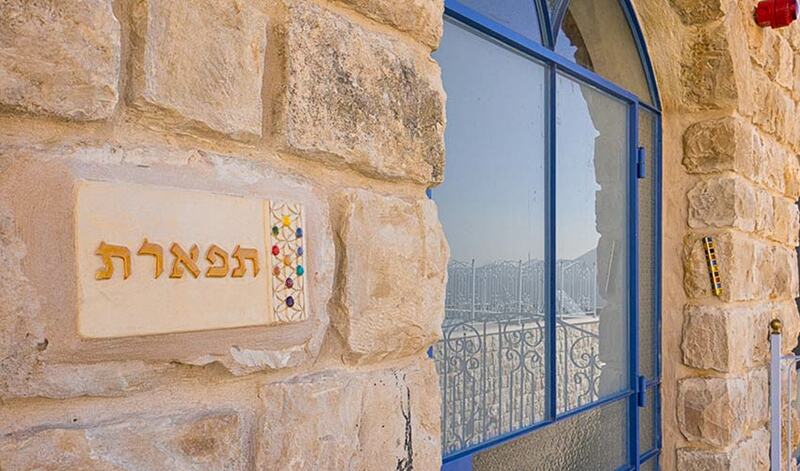 The cave of Shem and Ever is today a holy site in Safed revered by Jews and Muslims. Safed has been identified with Sepph, a fortified town mentioned in the writings of the Roman-Jewish historian Josephus. It is mentioned in the Jerusalem Talmud as one of five elevated spots where fires were lit to announce the New Moon and festivals during the Second Temple period. Safed’s Golden Age came in the 16th century when many prominent rabbis fleeing the Inquisition in Spain found their way to Safed, among them some of the greatest teachers of kabbalah who ever lived: the holy Ari Rabbi Yitzhak Luria, Rabbi Moshe Cordovero, Rabbi Hayyim Vital, Rabbi Shlomo Alkabetz (composer of the Sabbath hymn Lecha Dodi), Rabbi Yosef Karo (author of the Shulchan Aruch). * Note: shops in Safed are generally open from 9.00am – 6:00 pm, or until dark in summer. Some shops close for lunch between 1 or 2pm until 4 pm. 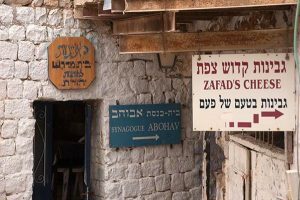 Abuhav Synagogue, one of the most beautiful of the Safed synagogues, is unusual in that it has three Torah arks, one of which houses the holy Torah scroll of the great 14th century Spanish sage Rabbi Yitzchak Abuhav, for which the synagogue was originally built. HaAri Ashkenaz Synagogue has a beautiful carved olive wood bimah and is one of the most well-known and highly visited synagogues in Safed. Constructed in the 16th century by immigrants from Greece it was built on the site where the Holy Ari and his disciples would gather to greet the Sabbath in the open fields in the northern part of the city. HaAri Sephardi Synagogue is where the Holy Ari Rabbi Yitzchak Luria actually prayed and studied Torah (with the prophet Eliyahu, it is said). It is the oldest surviving synagogue in Safed, located near the ancient cemetery. Yosef Caro Synagogue is located in the building where the great sage served as head of the Rabbinical Court and later it became his study hall. Some of his writing was done in a room located underneath the Karo Synagogue. It contains several old Torah scrolls and a ‘Geniza’ section of ancient manuscripts. Alsheich Synagogue has remained standing since the 16th century and is the only building in the Old City to survive intact the earthquakes of 1759 and 1837. The Banai synagogue, located at the base of the Old Jewish Quarter, contains the grave of the 3rd century sage, Yossi Banai. It is also called the “Tzadik HaLavan” because of a miracle performed during the time of Turkish rule. The local ruler had decreed that if the Jews did not bring a great number of white chickens, they would be forced to pay a large collective fine. The impoverished Jewish community prayed at the grave of R’ Banai and R’ Yossi Saragosi. When the community awoke the following morning they found that all their chickens had turned white. Avritch Synagogue is famous for the miracle of 1837 when Rabbi Dov from the town of Avrich in the Ukraine was leading his Hassidim in prayer. Suddenly he called his followers to come and stand next to him at the front wall. As the men rushed to their rabbi, a strong earthquake struck the city. Close to a fourth of the city’s citizens died but all the men at the synagogue survived. Safed’s ancient cemetery goes back to the 1st century CE and contains the remains of sages from the Mishna period as well as the great 16th century Kabbalistic masters the Holy Ari, Rabbi Joseph Caro and Rabbi Shlomo Alkabetz. The Ari Mikvah (ritual bath) at the top of the cemetery, is still in use today by men only. According to tradition this is the Mikveh used by the Ha’Ari himself. Immersion is in a cold pool fed by a natural spring. The General Exhibition of the Artists’ Colony houses a collection of works by Safed artists. There are also galleries in the plaza outside. 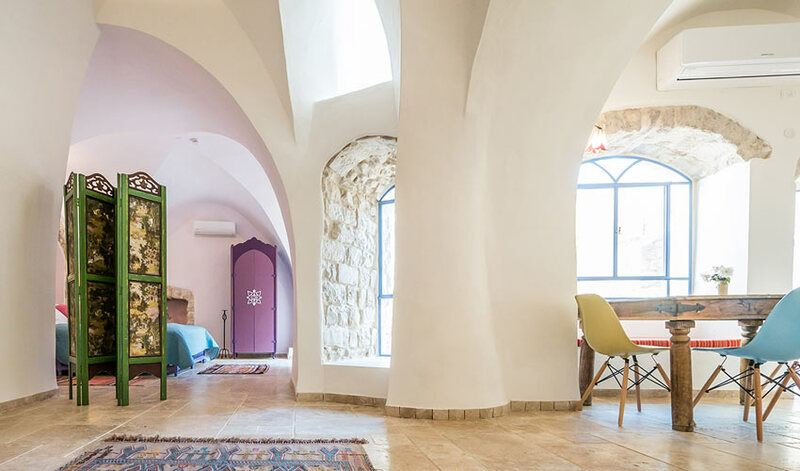 Located in the old mosque of the former Arab Quarter of Safed, which became an Artists’ Colony in the 1950s and was home to some of Israel’s leading artists. Safed Candle Factory: just past the Ari Ashkenaz synagogue. Lovely multicolored Shabbat and Havdalah candles, natural beeswax candles and incredible wax sculptures. 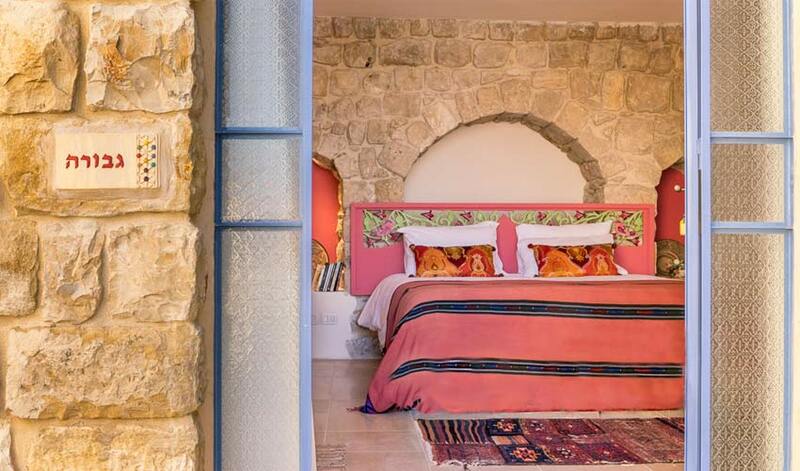 Beit Hameiri Museum– a historical museum documenting the life of the Jewish community of Safed from the beginning of the 19th century until 1948. Hours: 9 am-2 pm. Call 04-6971307 or 04-6921939 for more details. 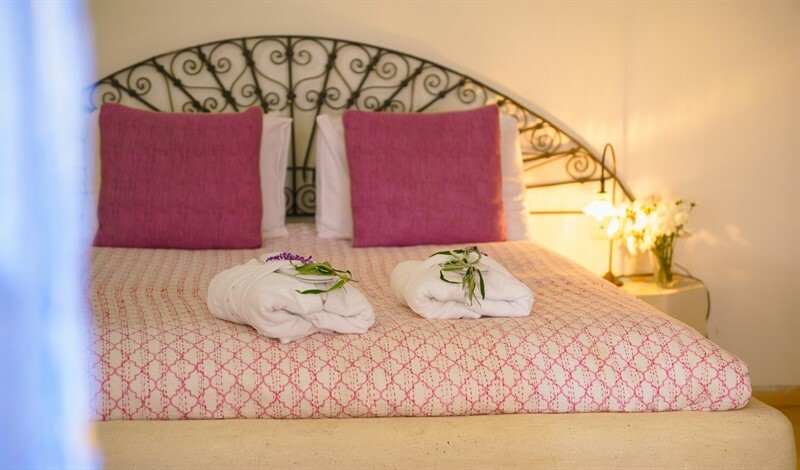 Safed has two great dairies, both making delicious artisan cheeses from traditional recipes. HaMeiri Cheese (Keren Hayesod St., near Beit Hameiri), tel: 04-6921431, 052-372-1609. www.hameiri-cheese.co.il Every Friday, a guided tour of the dairy takes place at 12:00. Tours can be arranged Sundays to Thursdays for groups of six or more. Kadosh Cheese, 34 Yud Alef St., Tel: 050-729-9798. A hidden gem, the tiny Kadosh dairy has been producing cheese for over 100 years. In addition to many varieties of sheep and goat cheeses (including its’ famous Safed cheese), the dairy also produces delicacies such as stuffed vine leaves, olive oil and the famous Kadosh halvah (a desert made from tahini). 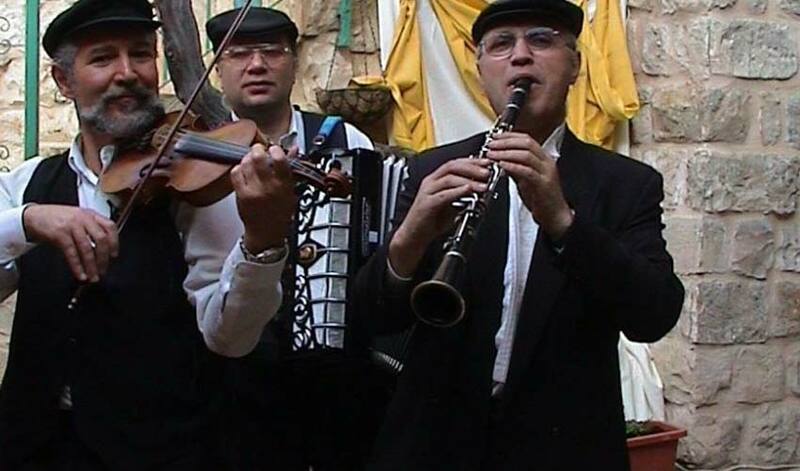 Old Safed Winery, Beit Yosef 29 – www.safed-winery.co.il For wine tasting and tours, contact Moshe, at 050-4480-884 or 054-3478874. 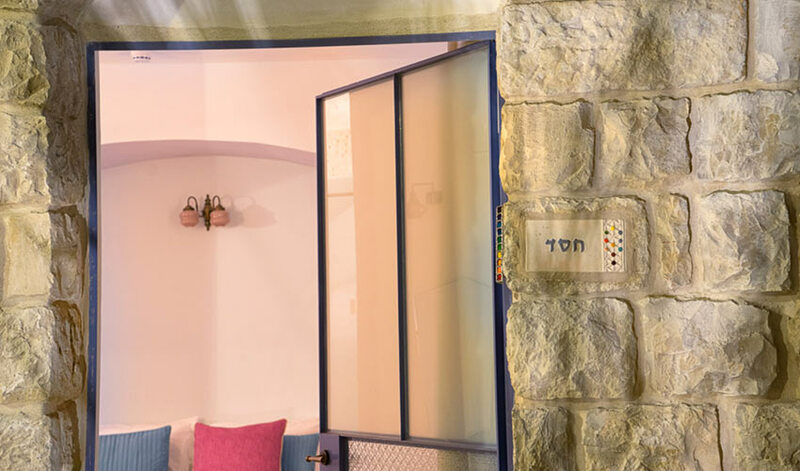 The winery is located on Yosef Caro Street near the big staircase, below the Eshtam Building which is the first building off the main parking lot. Produces over 20,000 bottles of wine a year including Carbernet Sauvignon Gewurziraminer, Carbernet Frank and both a dry and sweet Merlot. 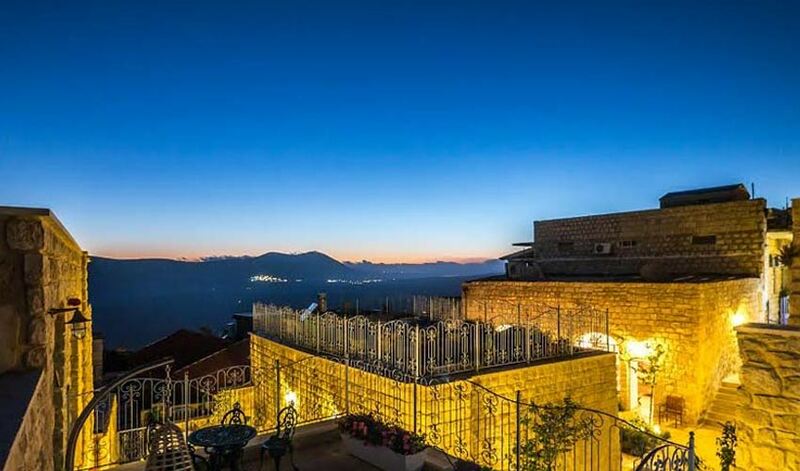 The Citadel (Metsudah) – the highest point in Safed, Citadel park is situated in the center of town. 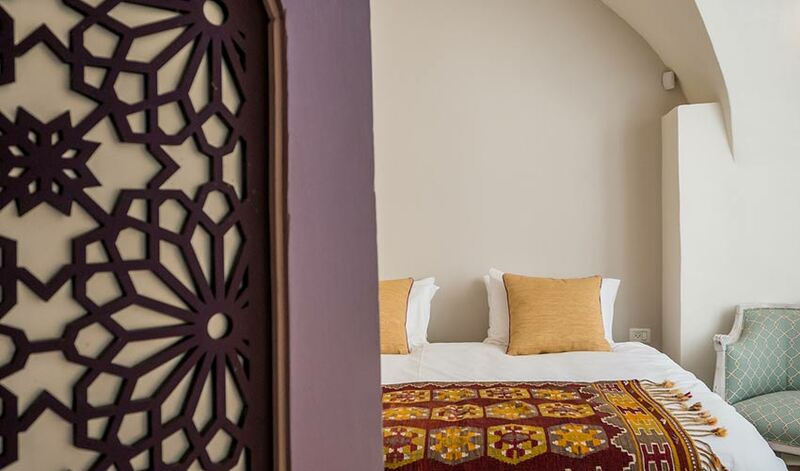 It’s located on a hilltop and affords a great views of the mountains and, on a clear day, the Kinneret (Sea of Galilee). You can walk around the remains of what was in its day the largest Crusader castle fort in the Middle East. It is also a great spot for a picnic.